A herniated disc is also called a bulging disc, hot disc, and slipped disc. It can occur anywhere along the spine, but the most common area is in the lumbar area of the spine (low back), and then in the cervical area (neck). How Can We Help You "Get Your Life Back?" We are the Back Pain Institute in Colorado Springs, and we specialize in highly effective FDA-approved, low-risk, noninvasive, nonsurgical treatments for herniated discs (sometimes spelled "herniated disks"). To find out about our specific treatments, please see below. The truth about treating herniated discs is that what works for some people does not work for others. It is not a one-size fits all situation. However, do you agree that starting with the least expensive, most noninvasive treatments first makes sense? This reduces your physical and financial risk substantially. If your answer is yes, then let's address the wide range of treatments patients have used to alleviate their pain, and ideally move the disc back into its rightful place between the vertebra. Herniated disc treatments can range from a simple stretch (which can cost you one doctor's visit with us) to a discectomy (which can run from $30,000 - $100,000). In a discectomy, doctors remove a portion of the herniated disc. It is reported that only 3-5% of back pain sufferers are candidates for back surgery, so before you go done that road, give us a call. Spinal decompression - in conjunction with chiropractic, stretching, and stabilization exercises - have helped tens of thousands of people across the US who thought that their only option is surgery. As you know, there is no such thing as minor surgery, and prescription drugs often come with their own side-effects that can begin a cascade of other health problems. Call today for an affordable, effective, noninvasive, FDA-approved herniated disc solution in Colorado Springs, CO.
Signs and symptoms of a herniated disc include shooting nerve pain down the leg or arm, restricted movement (often linked to a specific injury), numbness in extremities, and moderate to severe pain. The best way to know, for sure, that you have a herniated disc is to get an MRI. Otherwise, your pain may be caused by something else (spasm, disjointed spine, scar tissue, fracture, or other disease). 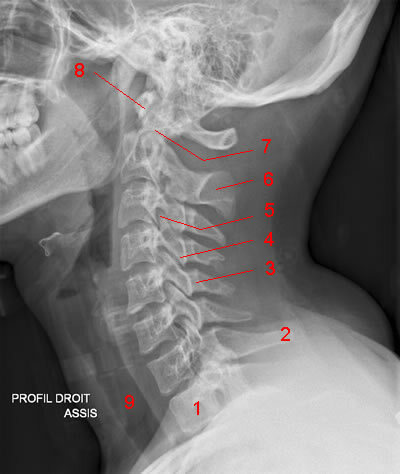 X-rays can help in the diagnoses process, however an X-ray does not clearly show discs, only vertebra. An X-ray can show a reduction in disc space between vertebra which hints at a possible disc herniation, but an MRI clearly shows both, as you can see from the two pictures. A herniated disc can occur because of traumatic injury - such as a car accident, football game or pugil stick to the head (some of military patients have experienced this) - a severe muscle imbalance or spasm, loss of curve in the neck or back, and even a disjointed segment of the spine. There is a natural space between each vertebra of the spine that is filled with the disc. This disc acts as a cushion. When we are healthy and/or young, these discs are filled with fluid; they are plump and provide a healthy distance between the vertebra and allow them to move smoothly as we twist, turn, bend over, jump, run, etc. As we get older these discs slowly degenerate and lose their height. This can happen naturally due to age, or the process can be sped up by excessive weight gain, dehydration (which can impact the disc's hydration), lack of movement in the spine, and smoking (which dehydrates the disc as well). Traumatic injuries can compress the vertebra and actually force a disc to move out of position and begin to impede nerve flow, as you see in the MRI to the right. One interesting thing to note is that there is no blood flow to the discs of the spine, so the only way that they receive nutrients is via movement, which pumps the disc. If you have been sedentary or injury has restricted your movement, these discs begin to degenerate. 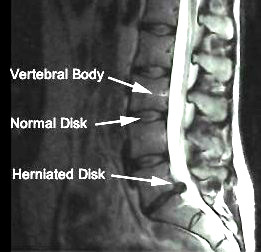 MRI of a herniated disc (also spelled "disk"). X-ray clearly pictures bone, but not soft tissue. An MRI is the best way to diagnose a herniated disc.